This article on gas hot water heater troubleshooting will help you to locate your problem and get it repaired quickly. See below for guidelines on what to look for and information on how to fix it. Don't have a gas water heater? See 'Fixing Electric Water Heaters'. Not sure which kind you have, see 'Identifying Water Heater Types', for a description of each type. There are two key topics associated with 'Gas Hot Water Heaters'. (1) 'Water Heater Pilot Light Issues' - If the pilot light goes out, the water heater won't work. (2) 'Problems With a Gas Water Heater Thermocouple' - A bigger problem than just lighting the pilot. Some common problems for all types of Hot Water Heaters are, pressure relief valves, leaks, sediment, drain valves, anode rods and dip tubes. A general troubleshooting discussion is provide in the article, 'Identifying and Repairing Water Heater Problems'. The danger with a gas hot water heater is the gas itself. If for some reason gas is allowed to escape without being ignited, you can get an explosive situation. Gas has an odor to it that you are probably familiar with. The odor is added as a safety feature. 'I smell gas', something you hear or say from time to time is not from smelling the gas at all. Natural gas is odorless. A chemical is added to alert people to a gas build up. Natural gas can explode. Caution needs to be exercised to make sure the gas is shut off and only turned on when the pilot is lit. Some repairs that result from gas hot water heater troubleshooting are fairly simple. Others may require some work. We are in the whitewater of cost potential here. A new hot water heating unit can run anywhere from $350 to $3,500. Installation costs can run from $200 to $1,600. This is all for a new system. Yes, you may only need a $20 part. Add that to a service call and you should be looking at $100, more or less. Although repair bills of several hundred dollars are not unheard of. Just keep in mind that with the potential above you might get some serious selling when you try to get someone to fix your hot water heater. Gas hot water heater troubleshooting is moderately difficult. Remember there is a potential danger with the gas. Natural and propane gas can explode. Never attempt a repair unless you have turned the gas off and are thoroughly familiar with safe working practices. WARNING!! Natural Gas Can Explode! Make Sure the Gas Is OFF!!! The Hot Water Can Be VERY HOT!!! WARNING!!! Is the pilot lit? Check the pilot light first. Are you getting gas, is it turned off for some reason? Natural gas can explode, there is a danger. Make sure the pilot is properly lit and the burner working before you leave the area. Not getting the hot water tank working will leave the family a little unhappy. Some of the operations involve water. Take precautions when water is involved, it gets everywhere. Take a look at the possible problems below. Try to find a match for your situation. Follow the links to get to the right information. Read through that information before you proceed. Many problems can have more than one cause. Check the pilot light. Is it on? The thermocouple provides a safety feature for a gas hot water tank. When the pilot is not on, the valve will not allow any gas to be delivered. See the article 'Hot Water Heater Pilot Light', for the information on what to do . Did you check to see if the gas is on? Go to the article 'Hot Water Heater Gas Valve', for direction on issues with the gas valve. This gas hot water heater troubleshooting exercise starts with the thermostat. Go to 'Gas Hot Water Heater Thermostats' for a discussion. A clogged flue or vent could be the problem. See 'Venting a Gas Water Heater' for information on keeping your vent clear. A defective thermostat is also possible. The thermostat is part of the gas valve. See 'Water Heater Gas Valve Problems' for the issues surrounding this device. The dip tube is another possibility. The article 'Hot Water Heater Dip Tube' addresses this problem. You need to follow the correct procedure to light the pilot. See 'Problems with Gas Water Heater Pilot Lights' for instructions. Gas hot water heater troubleshooting usually leads you to the thermocouple. Go to the article 'Gas Water Heater Thermocouple Issues' for information on this common repair. The other less common problem would be the gas valve. A bad gas valve will not allow any gas to go to the burner or pilot light. See 'Fixing Hot Water Heater Gas Valves' for the issues surrounding this device. The thermocouple is usually the problem when this happens. Go to the article 'Gas Water Heater Thermocouple Issues' for information on this common repair. The other less common problem would be the gas valve. A bad gas valve will not allow any gas to go to the burner or pilot light. If the pilot light lights and then shuts off it is not the gas valve. If it won't light at all, see the article, 'Fixing Hot Water Heater Gas Valves' for the issues surrounding this device. A clogged or partially clogged vent can also cause this problem. See 'Gas Water Heater Vents' for information on keeping your vent clear. The first thing to check is the thermostat. Go to 'Gas Hot Water Heater Thermostats' for a discussion. A defective thermostat is also possible. The thermostat is part of thegas valve. See 'Hot Water Heater Gas Valve' for information on what can be done. Again the thermocouple could be at fault. Go to the article on 'Gas Water Heater Thermocouples' for information on this common repair. The other less common problem would be the gas valve. A bad gas valve will not allow any gas to go to the burner or pilot light. See the article on 'Hot Water Heater Gas Valves' for the issues surrounding this device. A clogged or partially clogged vent can cause this problem. See Venting a Gas Water Heater for information on keeping your vent clear. This is caused by a dissolved anode. The anode rod has metal in it that is supposed to oxidize in place of the steel in your tank. This prevents your tank from leaking. When the metal is gone the steel core and your tank start to rust, thus discoloring the water. See 'Hot Water Heater Anode Rods' for information on the anode rod. A clogged or partially clogged vent can cause this problem. See 'Venting a Gas Water Heater' for information on keeping your vent clear. The pressure relief valve very rarely leaks in the true sense of the word. It does however vent water which can seem like a leak. The water will vent for two reasons, one is that the pressure in the tank is too high, this should be addressed as soon as possible. The other reason would be a defective valve that vents even when there is not a problem. Issues with this item are found in the article, 'Checking Pressure Relief Valves'. Depending on the location of the leak, this might be a big problem. There are four possible spots that the water heater can leak, the water lines, the pressure relief valve, the drain valve and the tank itself. Go to the article 'Repairing a Leaking Hot Water Heater' to track down your problem. WARNING!! Natural Gas Can BE Dangerous!!! The Water In Your Tank Can Be VERY HOT!!! WARNING!!! Gas hot water heater troubleshooting always seems to start with the pilot light. Most gas hot water heaters us a pilot light to ignite the burner. There are some more expensive models that use electronic ignition. When the pilot light is out or won't stay on, you will not have hot water. Follow the above link to get to an article that discusses the issues related to the pilot light. Find out if this is the type of repair you can do yourself? The thermocouple is a sensor that tells the gas valve when to allow gas to flow to the burner. 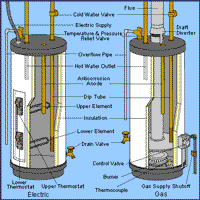 Gas hot water heater troubleshooting often involves the thermocouple. When they go bad the will not allow the gas valve to release any gas. No gas, no hot water. Follow the above link to get to an article that discusses the hot water heater thermocouple. This is a common do it yourself repair that you will probably be willing to attempt. The thermostat is part of the gas valve. There is not a lot that can be done to fix one that is bad, short of replacing the gas valve. The main concern with the thermostat is getting the temperature set right. Water that is too hot can be dangerous. Learn what the proper settings are. The gas valve controls the gas that goes both to the pilot light and the main burner. It uses the thermocouple to determine when it is safe to release the gas. It also uses an integral thermostat to know when more heat is needed. Explosions can result from natural gas that is not burned. Therefore the water heater gas valve has safety devices built in. Gas valves are a fairly expensive part and are quite a bit of work to change. Is yours really bad? Find out by following the above link. Make sure you have finished your gas hot water heater troubleshooting exercise before you assume it is the gas valve. Obstructions in the vent pipe can restrict the air flow to your water heater. This will cause the burner to operate poorly. It could mean a reduced amount of hot water. Badly clogged vents will result in dangerous gases building up in the home. When all else fails you may be faced with replacing your hot water heater. At this point you will have to decide if you are up to the task of replacing the water heater yourself. If you can get some help, you may want to consider it. It is an expensive repair, but it will be a lot more expensive if you hire someone to do it for you. There are several possible problems you can be having with your gas hot water tank. Sorry, but there are more issues than one article can cover. We have tried to point you in the right direction for finding the answer to your problem. Some of the answers to your problem may be more than you want to tackle. On the other hand, some repairs are not that hard. You be the judge. Gas hot water heater troubleshooting involves some problems that are fairly simple. Hopefully, even if you wind up calling a technician, you will be able to discuss the problem with him intelligently. Asking the right question will often save you money.